The moat is growing around Ctrip, and here's the proof. 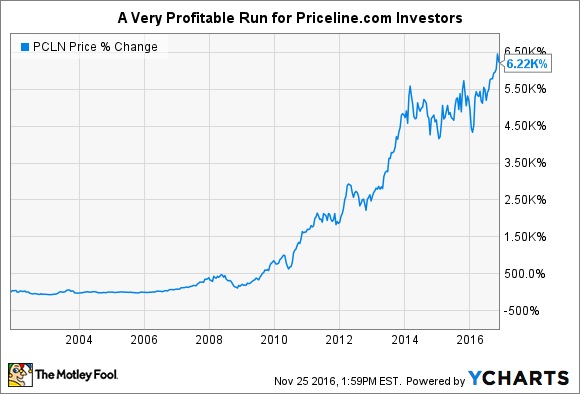 Beginning investors may be surprised to note that one of the most successful stocks of the past 15 years has been Priceline.com. And no, most of that growth didn't come from William Shatner's promotion of the "Name Your Price" option on the U.S. site. Instead, it came from the company's Booking.com subsidiary, which has become the "go-to" website for hotel bookings in Europe. What does all of this have to do with Ctrip.com (NASDAQ:CTRP)? Nothing... and everything. I say "nothing" because it's silly to look at the trajectory of one company or stock, and blindly extrapolate from it the future of another company. I say "everything" because there's still a lot to learn from the power of a significant moat in the online travel agency (OTA) industry. Priceline has been successful because it has benefited from the network effect: with each additional hotel or resort that lists on Booking.com, users have more motivation to search on the platform. And because Booking.com has more users, more hotels and resorts are motivated to list, as well. It's a virtuous cycle. With the consolidation of former rival Qunar (NASDAQ:QUNR) into Ctrip's ecosystem, Ctrip is now the undisputed leader among China's OTAs, and the most recent quarter shows why that's such good news for investors. Because the company's profitability is significantly skewed due to the consolidation of Qunar, these are the results that most investors are focused on. Perhaps even more importantly, revenue, gross profit, and operating profit were up 75%, 86%, and 10%, respectively, when we take out the effects of currency fluctuations. The rise in revenue -- and in particular, gross profit -- is encouraging. It's a sign that, because Ctrip has become the clear leader of the pack in China, the company is able to extract more profit from each travel or accommodation organization listing on the website. In essence, this is proof of the fact that Ctrip's moat is real and sustainable. We had a great third quarter with strong results. Net revenues were up 75% year over year, driven by solid organic growth and the inclusion of the invested company [Qunar]...The non-GAAP operating margin of 18%, materially exceeded our original expectation . And lest you be worried that operating profit is growing nearly as fast, it's important to remember that (1) Ctrip assumed all of these salaries and bonuses previously paid out by Qunar, and (2) the company is still aggressively reinvesting in its own business, to further differentiate from any potential rivals. As is the company's tradition, all four of the key business segments were given more specific breakdowns. These were solid results across the board. Transportation, in particular, saw substantial growth. Bus ticketing alone jumped 200% over the past year, and while it may not be a high-margin business for Ctrip, it's no doubt a high-volume one, and one that can further cement Ctrip as the OTA of choice among everyday Chinese citizens. Perhaps the most surprising announcement came just before earnings were released, when Ctrip's board announced that founder James Liang would be stepping down as CEO -- though remaining as Chairman of the Board -- and turning the reins over to former COO Jane Sun. Beyond that, it's important to note that Ctrip is serious about its expansion beyond just China. The company announced that it had acquired Scottish metasearch company Skyscanner in an effort to beef up its international travel options for customers. Specifically, Liang thinks that it should open the door to easier travel between China and the United States. As Liang said in his remarks, "Over time, Ctrip has the vision to grow the Company into a world-class travel group." Without a doubt, the improvement in gross margins combined with an upbeat outlook helped to account for Ctrip.com's almost 10% jump following the Thanksgiving break in the market. Looking toward to the fourth quarter, the company still sees revenue growing between 70% and 75%. If gross margins can continue expanding while that sales clip continues, it would be an enormous boon for long-term investors.